The Siddhi Vinayak temple at Prabhadevi in Mumbai is a well visited one attracting thousands all through the year. The Temple: The known history of the temple dates back to early nineteenth century. This temple has been renovated thoroughly in the late 1900s in order to accomodate the needs of the surging crowds of devotees that throng the temple during festive occasions. The sanctum here houses a small mandapam enshrining Siddhi Vinayak. The inner roof of the sanctum is plated with gold, and the wooden doors to the sanctum are carved with images of Ashta Vinayak. 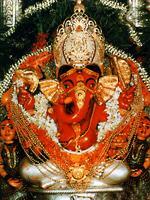 Siddhi Vinayak: Most icons of Ganapati depict the elephant faced God with his trunk curled towards his left. Siddhi Vinayak in Mumbai, Siddhi Vinayak at Siddhatek in Maharashtra as well as Karpaka Vinayakar at Pillayarpatti in Tamilnadu are depicted with a trunk pointing to the right (Valampuri). Ganapati here is depicted with four arms bearing a lotus, an axe, modakas and a garland of beads, flanked by his consorts Siddhi and Riddhi. Festivals: Hundreds of thousands of devotees throng the temple, especially during Angaraki and Sankashti Chaturti days, when there is a continuous stream of visitors for as long as a 24 hour period.